Jamie is living a busy life in Edinburgh as a printer, but apparently with some less legit business going on the side. Jamie is shocked by Claire’s sudden appearance in his print shop. Claire shows Jamie a packet of photographs of Brianna. Jamie is clearly moved. Jamie tells Claire about his son Willie. 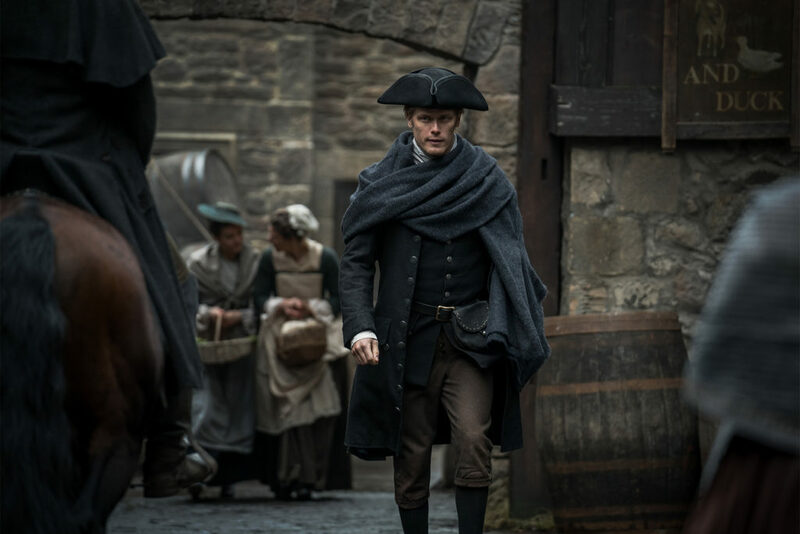 They head out to meet Mr. Willoughby, first running into Fergus in the street. 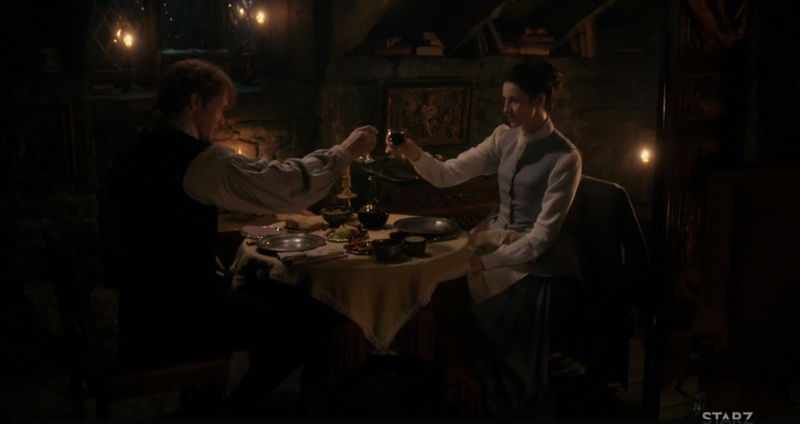 Jamie brings Claire to his room in the brothel, where they reconnect over dinner before going to bed together. Young Ian makes an appearance. While Jamie is out on business, Claire has breakfast with the ladies of the house. When she goes back up to Jamie’s room, she finds a dangerous man searching the room. Ah! The reunion! The printshop! It was all so glorious and romantic… and yes, awkward too. It’s been 20 years. I loved how the actors shows the strangeness of this reunion. For Jamie, it’s practically a supernatural moment. He never thought he’d see Claire again, and can’t quite believe she’s real. And for Claire, after years of yearning, and then all that searching, it all comes down to this moment. They begin with tentative kisses. Neither quite knows the other at this moment. 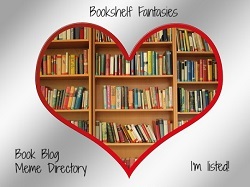 Claire can’t be sure Jamie wants her, and wonders if she still fits into his life. Jamie wants to know why Claire is there — has she come to be with him, or is she only there to bring him news of their daughter? It all feels so real. It might be nice to imagine that they’d simply fall back into one another’s arms as if no time has passed, but this is so much more realistic. They’re both self-conscious about having aged (Jamie is adorable in reading glasses! 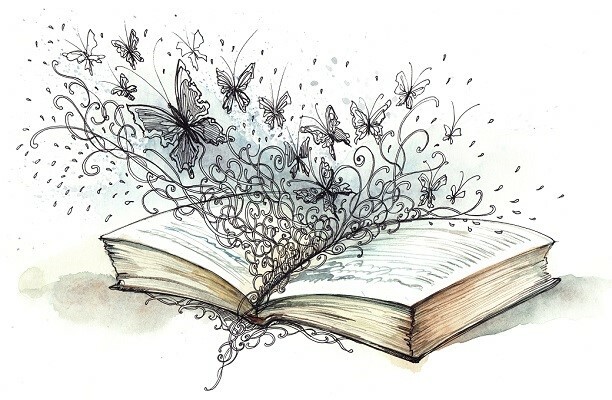 ), and there’s so much life to catch up on. Certain book moments are captured splendidly. I love the scene of Jamie looking at photos of Brianna. First, Claire has to explain what photographs are… and then she has to reassure Jamie that it’s perfectly normal for a teen-aged girl of the 1960s to be hanging out in a bikini. Somehow, I don’t think Jamie will ever get with the program on that one. Jamie’s business keeps getting in the way of the reunion, but again, that makes it feel more real. Jamie has commitments and business dealings, and none of these stop just because Claire walks in the door. The meeting with Fergus in the street was brief but lovely. 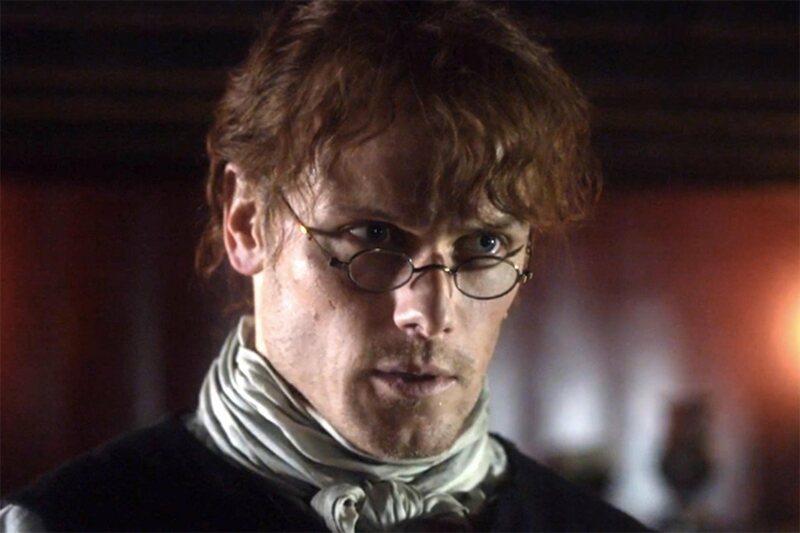 I’ll miss young Fergus, but I think this grown-up version will do just fine! The love he feels for Claire is palpable, and there’s a sweet but sad moment when Claire touches Fergus’s replacement hand. 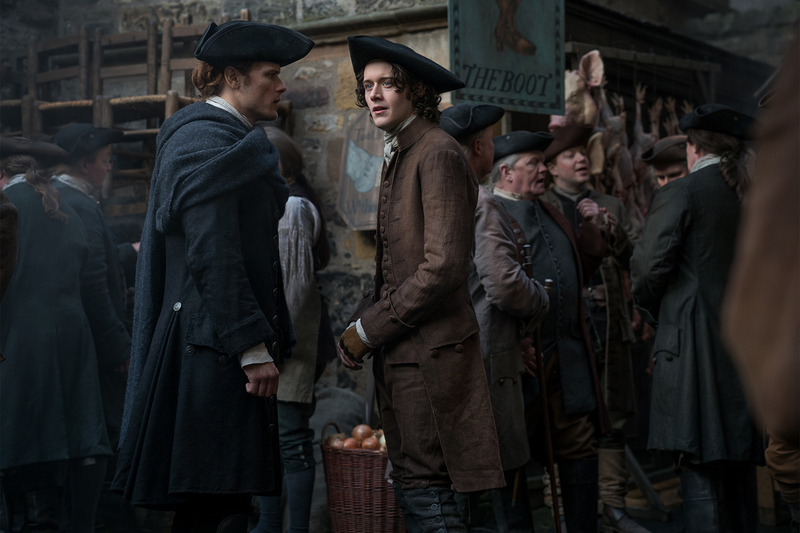 For book readers, we all probably caught Fergus’s questions to Jamie “what about…?” and know exactly what it means. I’m glad the show kept the little hints that there’s something more to Jamie’s situation than what Claire knows. As for their first night together, it was beautiful and sweet, and in some ways a call-back to their wedding night. Claire and Jamie are upstairs in his room, and first get to know one another all over again over dinner, filling each other in on the missed years — where they’ve been, what they’ve done, and who they are now. When they’re finally ready to go to bed together, they’re eager but shy. 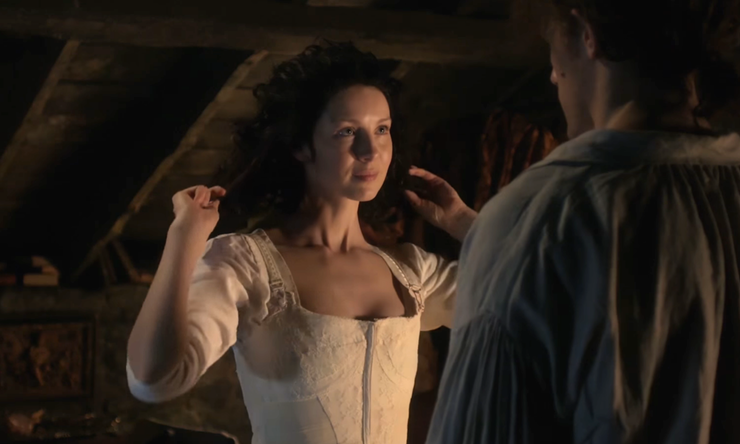 Claire covers herself up once she’s naked, not sure if Jamie will still be attracted to her after all these years. (He is.) They’re tentative at first (and Claire has to teach Jamie what a zipper is), but ultimately they fall back into the intense sexual chemistry that they’ve always had. The show makes clear that their reunion won’t be easy. They have so much to catch up on, and really need to find out who they each are all over again. But this episode shows that the foundations of love and desire are still there, and indeed have never left. The reunion was all I could have hoped for, and then some. One change from the book that really made me happy is that Jamie tells Claire about Willie right away. We know that there are still some secrets he hasn’t told, but there’s no reason to keep this from her. Claire wanted to know if Jamie loved Willie’s mother, and he told her he didn’t, although we can assume he’ll tell her much more about just how Willie came to be at some point down the road. I’m so glad that this is out in the open between them. If they’re to succeed in rebuilding a life together, they have to be honest. For Claire especially, who gave up an entire world — her daughter, her profession, her own time — to be with Jamie, she needs to know what’s in Jamie’s heart if she’s to stay. Willie is too important to Jamie for him to keep secret from Claire. The new cast members all appealed to me — Young Ian, Older Fergus, and Mr. Willoughby. 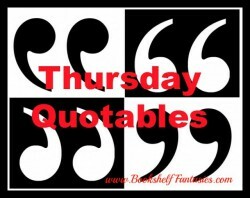 Young Ian is a particular book favorite of mine — I can’t wait to see more of him in action! Ah, this episode really delivered! The production team wisely gave extra time to this episode, and the story was allowed room to develop and blossom. We got to see the initial disbelief and euphoria, the joy, the shyness, the uncertainty, and everything else that would be natural for these two to feel after so many years apart. Neither has been fully their true selves for the past 20 years, always missing some essential part of their own soul. 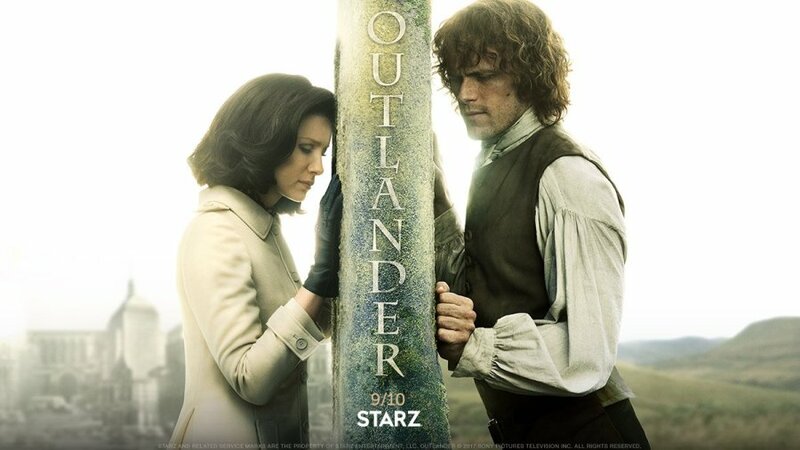 Now they’re together, and yes, they’ll have to work to rebuild a life that they can share and to rediscover how to be together, but their love remains, and with that, we can feel assured that Jamie and Claire will be okay.